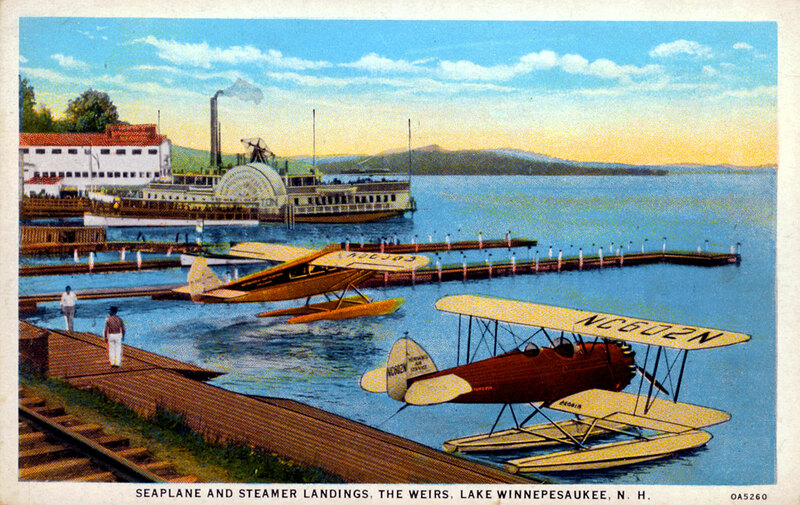 Above, a rare color photo postcard of the Weirs Seaplane Base. With no sign of the beach, this dates the photo as circa 1949. 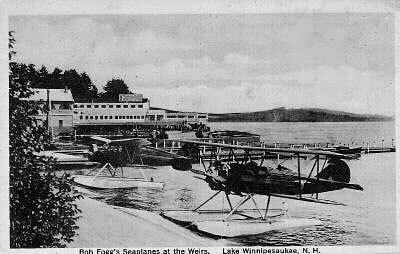 Below, a front view of the Weirs Seaplane Base. Photo provided courtesy of Jane Rice, grandaughter of Thomas E.P. Rice, who was an owner of the base from 1934-1938. The article noted that in the winter, the planes flew south to operate a route between Miami and Bimini. Bimini, the closest of the Bahama islands to Florida, lies only a brief 45 minutes by air from Miami. The webmaster experienced this flight once, at the invitation of a family friend with a pilot’s license, who flew a small airplane from the Homestead airport to Bimini. A 1936 Souvenir flight ticket. Regular, commercial plane service, with paying passengers, began in 1923. 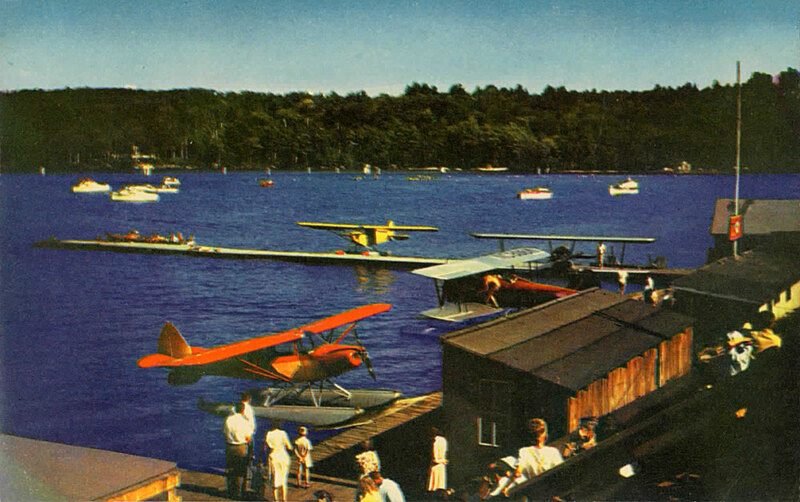 Before Irwin’s Winnipesaukee Gardens were built, the original seaplane base in Weirs Beach had been located on the other (northern) side of the Weirs Cafe. 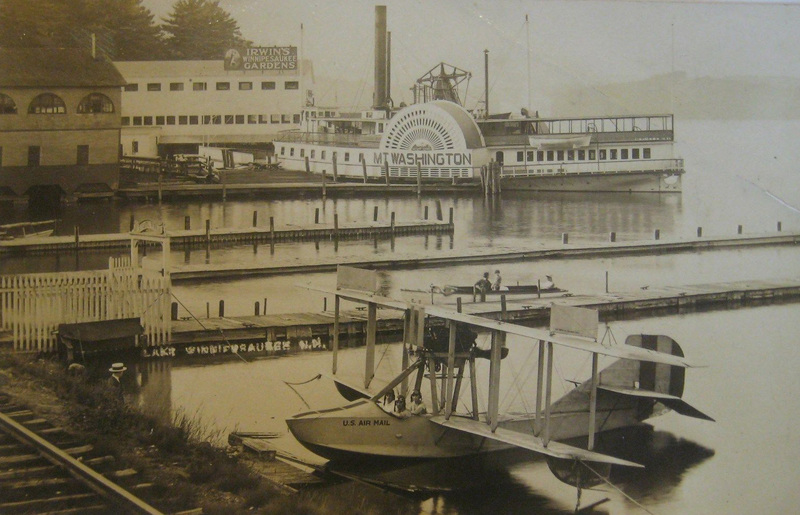 The photo below shows the seaplane base around 1925, shortly after it had relocated to its permanent position on the south side of the Weirs Cafe. 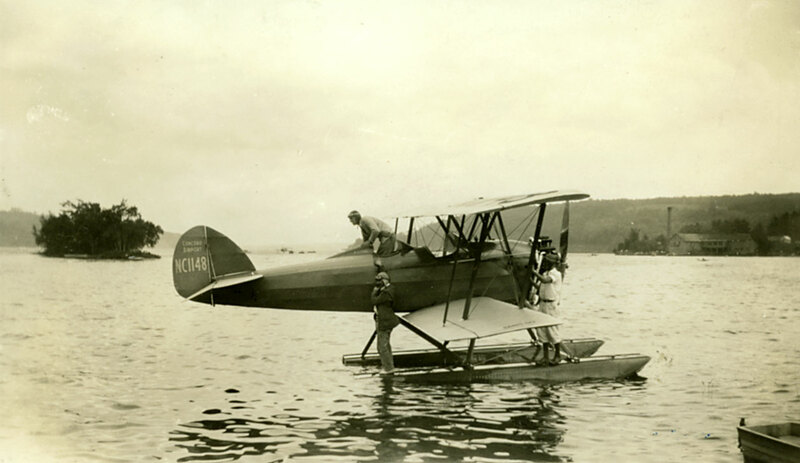 Note the designation “US Air Mail” on the body of the seaplane. 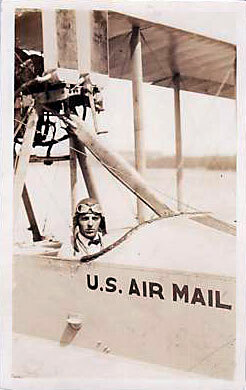 Earlier in 1925, Fogg had been granted the country’s first RFD airmail service contract. 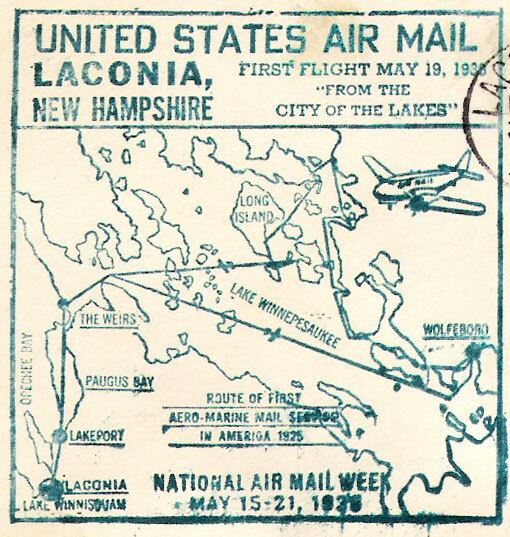 On August 1, 1925, Fogg began the “aero-marine” mail service, as it was called, delivering mail to ten points around Lake Winnipesaukee. 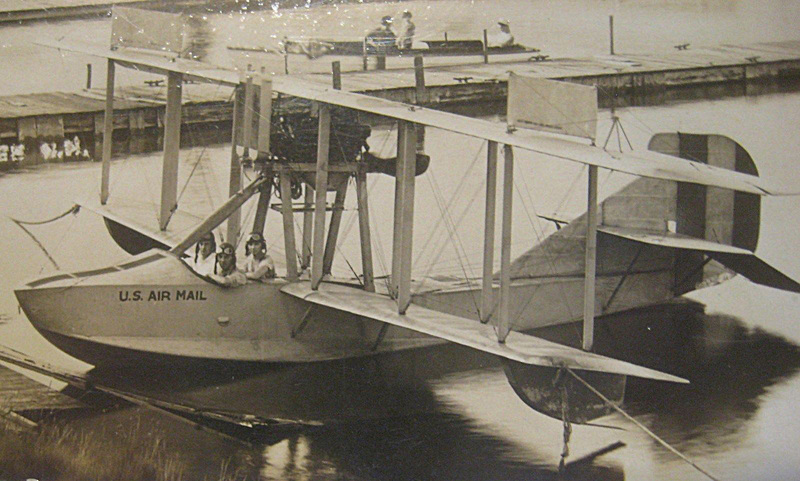 Click here for an interesting article about the 1925 airmail service. The Weirs Times sells a colorized verision of the photo below here, and featured a front-page article about the base in its September 30, 2010 issue. In 1938, the 1925 aero-marine service was commemorated during “National Air Mail Week” with this special rubber stamp which showed the route of the service. 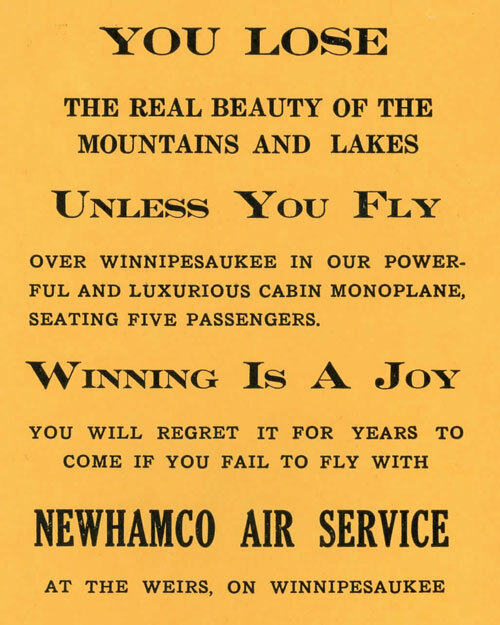 However, the 1925 service did not fly to Lakeport or Laconia. 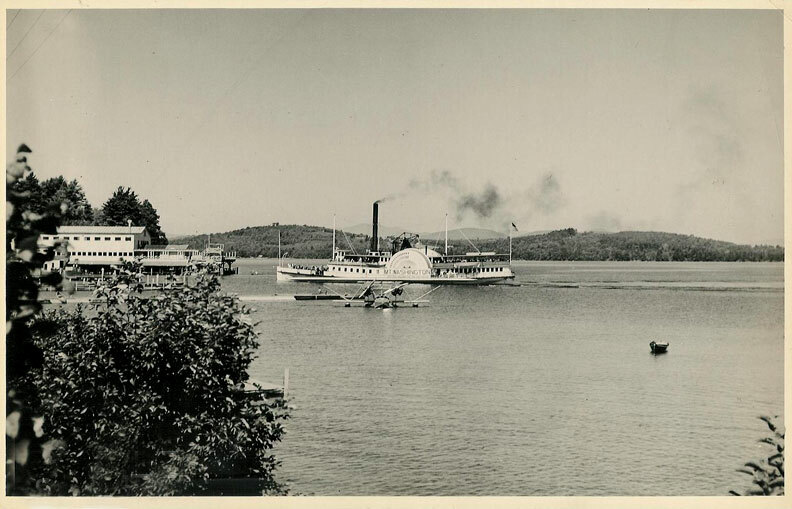 The 1925 service flew from Weirs Beach to Wolfeboro, then to Long Island and back to Weirs Beach, with various stops along the way. Bob Fogg in the open cockpit of his seaplane. Bob Fogg, leaning out of the back seat of his seaplane, seems to be inspecting the tail of his aircraft. 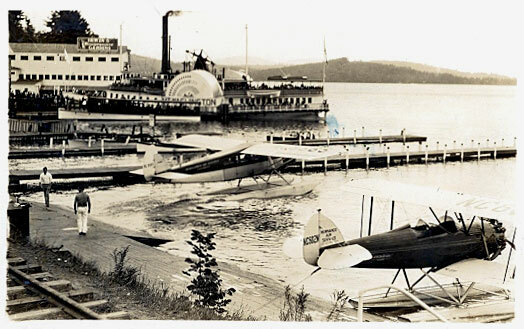 The markings “Concord Airport” and “NC1148” on the tail can also be seen in the photo of the Weirs Seaplane Base that follows. In the photo below, Bob Fogg is seen standing on the seaplane ramp of his Weirs Seaplane Base in his trademark aviator helmet and goggles. 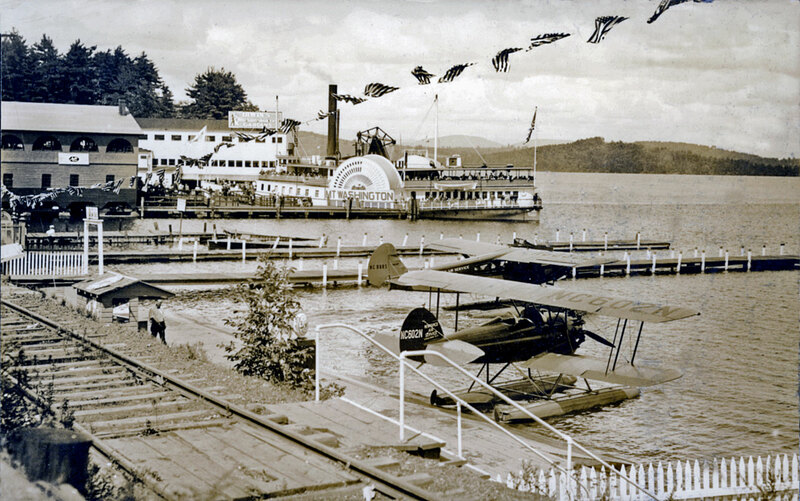 In the following pair of 1930’s photographs of the seaplane base, we see first a “real photo” postcard, and then a colorized version of the same. Fogg’s name is at the top of the sign! Here is a more modern looking seaplane, with only one wing. This monoplane design became the prevailing design for aircraft beginning in the late 1930s. 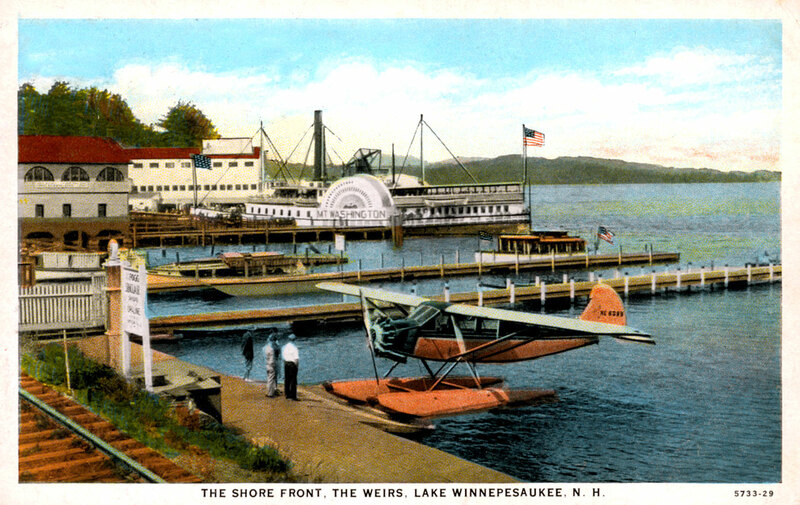 Here is another similar pair of Weirs Seaplane Base postcards from the 1930’s, with again the “real photo” shown first, and then the colorized version. The railroad tracks were a freight spur that descended underneath the railroad station’s freight house, where freight was transfered to the Mount Washington steamer. The spur was removed in 1940. 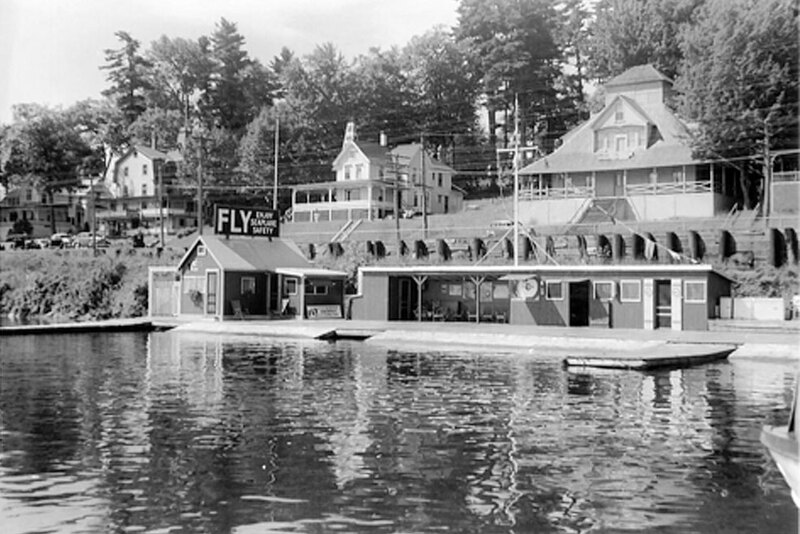 Another 1930’s photo of the Weirs Seaplane Base. The planes seen in this photo, as well as in the colorized photo seen above, are a TravelAir 6000B monoplane and a Waco CSO biplane. They were both destroyed in a hanger fire at the Concord airport in 1932. Note the markings for the Newhampco Air Service, seen on the body of the TravelAir and on the tail of the Waco. 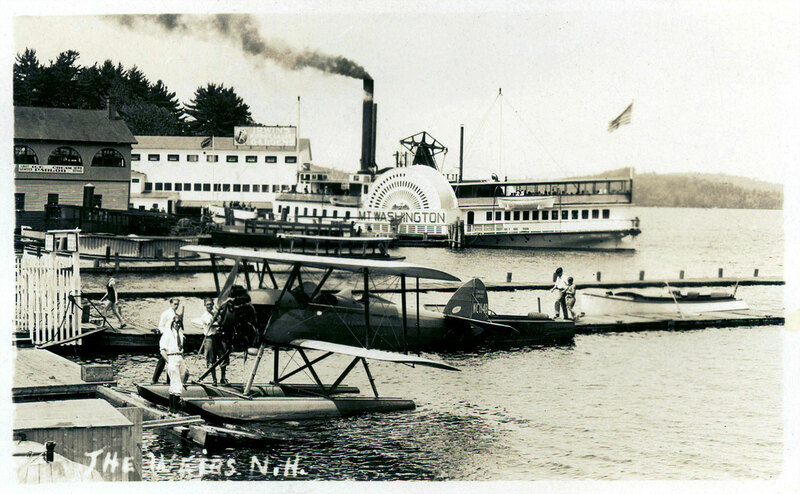 As different owners came and went, the name of the air service at the Weirs Seaplane Base changed frequently through the years. 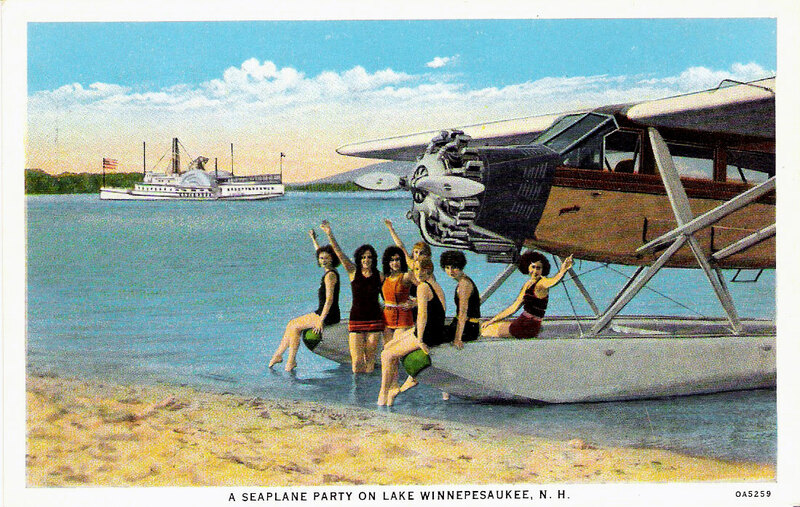 A seaplane party on Lake Winnipesaukee. 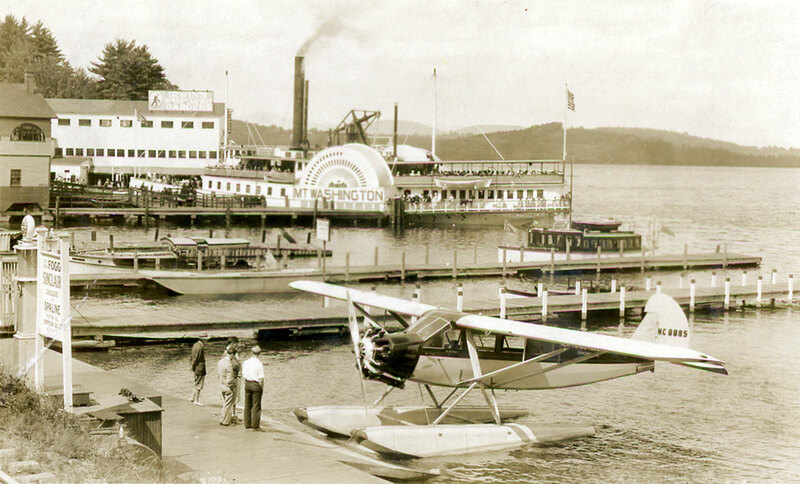 Here a Sikorsky S-38 seaplane is seen departing Weirs Bay while the Mount Washington steamer is arriving. 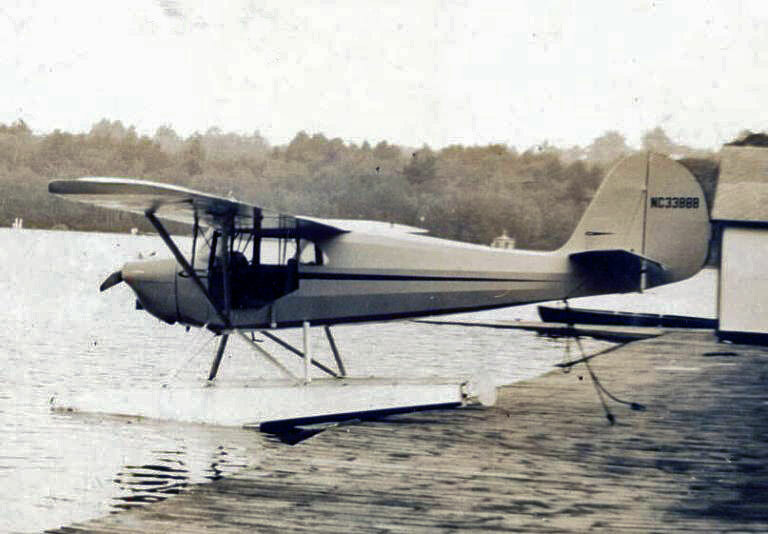 An Aeronca seaplane at the Weirs base, circa 1941. Note the Endicott Rock monument in the distance. 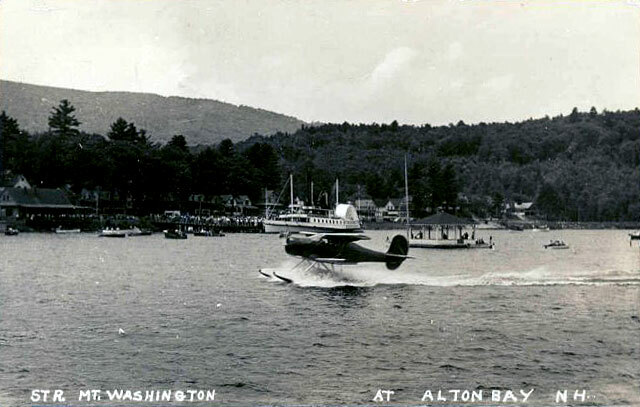 A Beechcraft Staggerwing seaplane is seen landing at Alton Bay, late 1930’s. 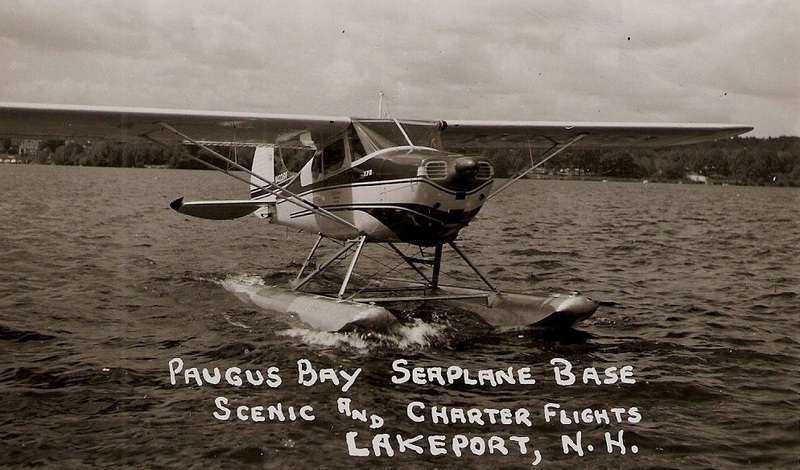 By the mid or late 1950’s, the seaplane base had relocated to Paugus Bay, where rides continued until around 1985. 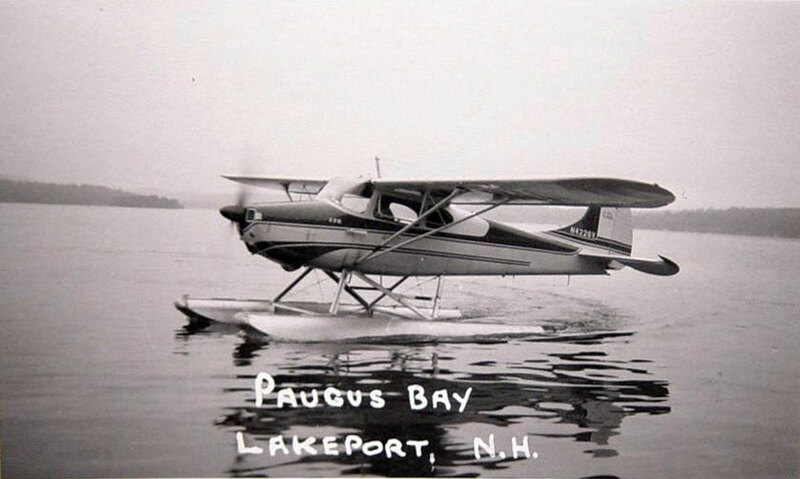 In 2010, after about a 25-year absence, seaplane rides are once again available from a Paugus Bay seaplane base, the Lakes Region Seaplane Services.